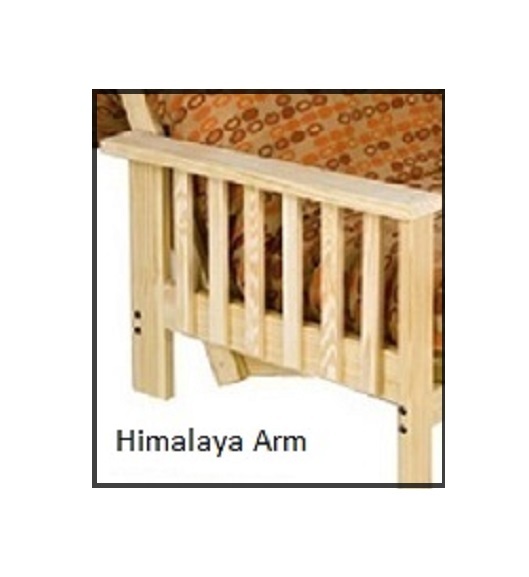 This mission-style futon frame is very popular with those who like a more robust style of armrest. It features a taller AND wider armrest, so it sits higher than our standard mission style futon. The added armrest width comes in quite handy too (for a drink, remote, or any other common items). We find people gravitate towards this one because it has a more substantial, bulkier look and blends very well with other camp and cabin-like decor. Ships easily in two boxes and comes with everything you need to set up your futon in a flash. Shown here is the HIMALAYA style. This mission style futon is built to look and feel heartier (even bulkier) than some futons do, and the taller/ wider armrest seems to appeal to those who rely on a substantial armrest regularly. The slats provide an opportunity to show off the wood’s grain and create a barrier to keep your pillows in place. The armrest is 24.25-Inches high.